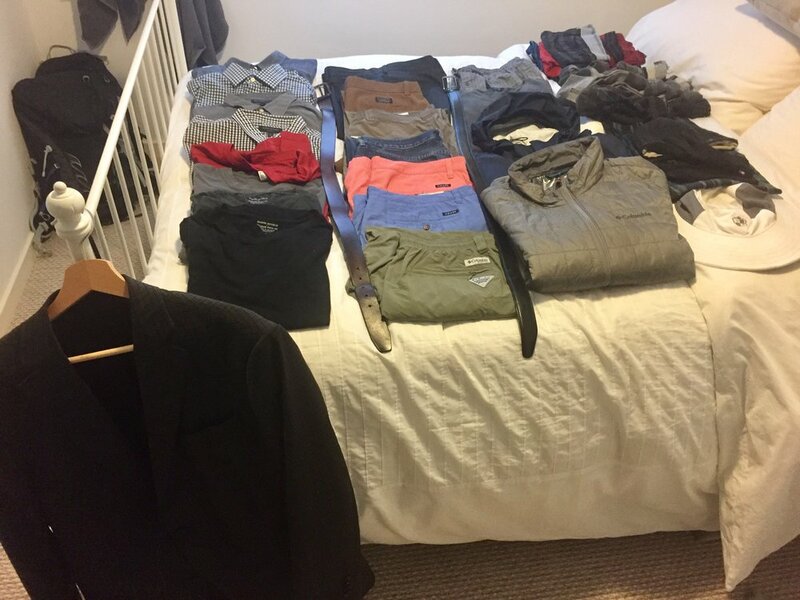 I have had several people ask, “How did you pack for nine months?” Now that we’ve reached our halfway point I feel pretty comfortable sharing what I did. We’ve had everything from 90-degree days to below freezing weather. I don’t profess to be an expert, but I have learned a few things after multiple trips abroad. All I can do is tell you what I’ve done, admit a couple mistakes, and you can use what you like. First, let me tell you what I brought in the way of clothing. If you have been following the blog or our Facebook page, you will notice me wearing the same clothes a lot. Unless you want to be lugging around a giant case, this is just going to be a reality. Pick clothes that are comfortable, work together in several outfits, and aren’t prone to excessive wrinkling. Since I knew we were going to be going through all sorts of weather, I had to be even more selective. Here is an annotated list of what I packed. I’ve included manufacturers where I felt you may be interested. I’m not endorsed by any of them but when they have worked well, I’ll point them out. OK, that’s the bulk of it. You can see a lot of black and grey with a few splashes of color and earth tones. Things that may stick out that you may not see on other packing lists-dress pants, shirts and a jacket. I like to dress up when we go to a nice restaurant or a concert. I may not wear these as often as some of my other clothes but I am very happy when I have them. I also think it helps in not being treated as much like a tourist. Europeans dress up for an event, whether it is a nice dinner or a theatrical show. I like being able to “fit in” when we attend these types of events. I also wear the jacket when we travel from location to location. I think you make a better impression when you get on a plane or train looking decent. I believe you are treated better than if you show up in pajama bottoms and a sweatshirt. Call me old-fashioned but I’m sure it’s true. Underwear. I’ve read some of these posts where people recommend very expensive silk or microfiber. Mine are cotton, Walmart’s finest. They are comfortable, dry just fine, and don’t cost $30 a pair. I’m fine with that. The hiking socks however, make a big difference to me. I really like the Wigwam socks and they are much more affordable than many. Shoes take up so much space. This is as minimal as I can get. My everyday/travel day shoes are my hiking shoes. They are also my waterproof hikers and good work shoes. My black dress shoes are comfortable, and pack tighter than the hiking shoes, dress up my jeans, and of course go with my dress pants and jacket. The sandals have come in handy for casual evenings, on the beach, by a hot tub, and in a questionable shower or two. My winter stuff (coat, hat, scarf, gloves) stayed in the bottom of my bags for the first three months. Right now my shorts and short sleeve button downs are occupying that space. As the weather got colder, I just started layering more and more. I also finally broke down and bought a warmer sweater and gloves. In the lake district we took some very windy, subfreezing hikes. Our coldest day was in the mid twenties, snow on the ground and wind whipping. Keeping my core warm, I layered a short sleeve tee, long sleeve tee, sweater, winter jacket and raincoat and I was fine. My hiking pants are rather thin but with my core warm, this worked as well. Moving on to the other stuff. Sunglasses, reading glasses, prescription glasses…I’m old! Just a few comments needed. Any liquids I have go in the toiletries bag. It a more permanent version of a zip lock and has worked going through security checks. The computer and phone keep us connected. The Bluetooth speaker gives us a little better sound quality than the computer or phone and helps make our rooms feel more like home. Adapters are all we need. No heavy converters needed for these devises. (Note: UK and European plugs differ from ours and from each other.) I brought my flute to help me keep active musically. I’ve sat in with a couple bands, played at a couple gatherings of friends (with iReal Pro and the speaker), and just played to relax. Finally my luggage. I have a Travelpro Maxlite 4 International carry on and an Osprey Talon 22 backpack. That’s it. I’ve carried them both on a plane. The backpack is small enough to double as a daypack when we hike. I also have a Camelback 2.5 liter bladder that fits into the backpack that I completely forget about…until we hike and then it comes in very handy. That’s it. I can completely pack or unpack in just a few minutes. There is still room in my bag to fit a bottle of wine or two in if need be. I am very happy not to have any more every time we move. We recently had a 30-minute walk to the train station. No worries. I see people lugging around these massive suitcases in the airports and train stations and I’m thankful not to be one of them. They are also probably only traveling for a week or two! I have made some mistakes. I really like my chinos and the chambray shirt I bought to go with them. I can wear anything I have with the pants, however they look a little funny with hiking shoes. The shirt however, only goes with these pants. It just doesn’t work with jeans or dress pants. I also could probably have done without the brown belt. I recently jettisoned a towel. It seemed like we might need it at some of our Work Away experiences, but after schlepping it around unused for four months, I finally donated it. As I said earlier, I am not endorsing or being sponsored by any company. That being said, I would like to give a special shout out to Columbia. I think their products are fantastic, economical, constructed well, look good, and last for ever. There are days I feel like a walking Columbia ad. The first products of theirs we ever bought were winter jackets we got on sale for our first European trip in 1990. We finally got rid of those coats when we moved last May. They were still in great shape after years of travel and multiple ski trips, but I was sick of my kids making fun of us for having the same coats for so long. All the Columbia stuff I have now is no longer in their catalog. It just lasts and lasts. The only issue we’ve ever had with one of their products was a seam that ripped out of my son David’s winter jacket in NYC this year. They replaced it, no charge. 20 years later, Columbia jackets still going strong! Well that’s it. I can’t say I’m not looking forward to wearing something else when I get home, but that’s still almost four months away! My suggestion to you is find a suitcase the size you feel comfortable with and don’t bring more than you can easily fit in it. Happy travels! Sign up with your email address to receive notice when a new blog is posted.